Meet Our Coaching Staff At The Virginia Sharks! IF YOU BUILD IT......THEY WILL COME! Virginia Sharks Head Coach Andy Hayes founded the organization back in 2016. Since that time the Sharks have become one of the best travel baseball organizations in the state. The Sharks have won 52 of their last 66 games since their 2016 innaugural season. Hayes is also a Varsity assistant coach at Salem High School. He helped lead the Spartans to their first state championship in school history in the spring of 2018. The Spartans finished with a school best 19-3 record, and were one of the best defensive teams in the state with the help of Hayes' leadership. Known for his attention to detail, Hayes helped guide a Salem defense that picked off a base runner in 18 of 22 games in 2018, and also became one of the best two-strike hitting squads in the state. Hayes played his high school baseball for Coach Jack Harvey from 1993-1995 in Norman, Oklahoma. Hayes helped lead the Norman Tigers Baseball program to a nationally ranked finish in 1995 and a 6A state championship. The Tigers finished 34-5 and #15 in the country according to the USA Today final high school baseball rankings. Hayes recorded an RBI single in the state final against Midwest City as the Tigers won 6-3. Head Coach Andy Hayes has a track record of success in baseball dating back to his high school and college days. Hayes played collegiately at Virginia Tech. He is a Varsity assistant coach at Salem High School, the 2018 Class 4 State Champions. As a junior, Hayes helped lead the Tigers to a state championship berth, and had a 3 RBI bases loaded triple. The Tigers lost to Westmoore High School 7-6 in extra innings. Aside from his state championship memories, Coach Hayes says one of the greatest moments in his career was hitting a home run against Michigan during the 1997 season for the Hokies. Michigan was his favorite college program as a kid. Sharks Assistant Coach Kendall Keffer joined the 12u staff in the summer of 2016 and has assumed the role working with the outfielders. Keffer has coached youth sports for several years and played his prep baseball at Glenvar High School. Keffer brings a wealth of knowledge of the game and will assist in helping the Sharks to develop into one of the best travel teams in the region. 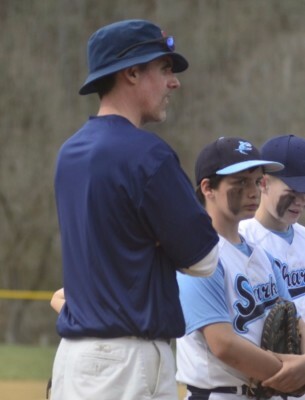 In addition to coaching with the Sharks, Keffer also was an assistant coach for the Salem 10u All Stars this past summer. 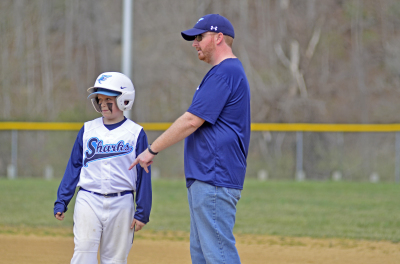 On Gameday's, Keffer can be seen coaching 3rd and 1st base for the Sharks. Sharks Assistant Coach Steve Clarke joined the coaching staff in the winter of 2017 after spending the last few years as an assistant coach for the Yard Dawgs. 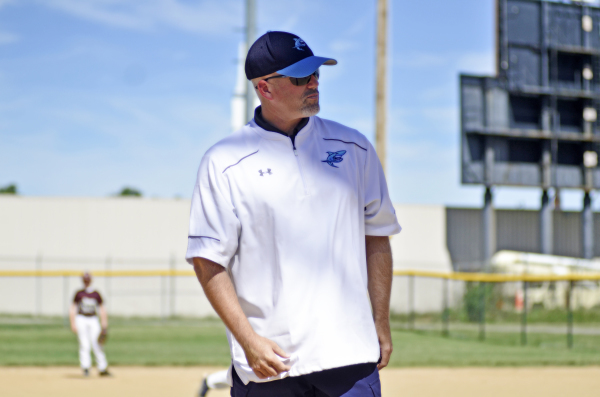 Clarke has coached youth baseball for several years and brings a wealth of knowledge to the Sharks organization. His primary responsibilities include helping the Sharks catchers, and he will also be working with the outfielders as well. Clarke coaches Rec baseball in Roanoke, and enjoys watching his two sons play travel baseball on the weekends. Sharks Assistant Coach Christiaan Sowers joined the staff in the summer of 2017. Sowers is a former Salem High School standout baseball player, and is a current member of the Ferrum College baseball program. Sowers brings energy and a solid baseball IQ to the Sharks Baseball program, and his experience of playing collegiate baseball provides a great opportunity for our young players to learn from someone who is playing the game at a higher level. Sowers has coached Summer League baseball in Salem prior to joining the Sharks Baseball Staff, and will take on more responsibilities within the organization once he graduates from Ferrum. There may not be a bigger baseball fan than Sharks General Manager of Media Production Helene Shain. Shain has raised three boys, all of whom played baseball throughout their youth and high school careers. Her middle son Cole is the Head Baseball Coach at Tuscarora High School in Leesburg, and had a four year career at William and Mary as a starting pitcher. Shain is the VP of Operations for the Gameday Broadcast Network, and has been a key member of the Gameday Management staff over the past 9 years. 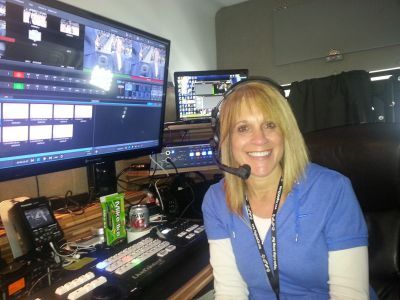 She is the producer of the Game of the Week HD Telecast, and also is in charge of editing and capturing video of Gameday's various productions. 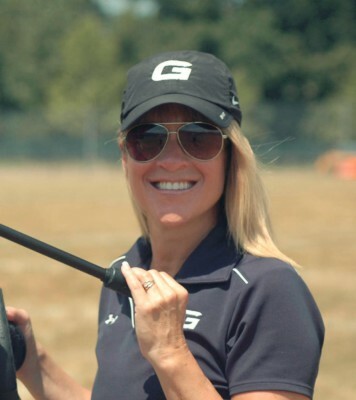 Helene Shain's role with the Sharks Baseball Organization includes helping to capture the games with video and still photography, and organizing team operations for tournaments. Her favorite baseball team is the Yankees, and her favorite baseball moment is watching her son Cole pitch against North Carolina while at William and Mary. Mrs Helene Shain volunteers her time to help the Sharks families enjoy the video replays of the games, and also is a skilled photographer who captures some amazing pictures of the action.